See photos from the battlefield tour course on the Laurier Brantford History Facebook page. For many university students, the two world wars are topics usually relegated to the pages of a history textbook. But for a group of students at Wilfrid Laurier University’s Brantford campus, the stories of sacrifice and victory are anything but past tense. 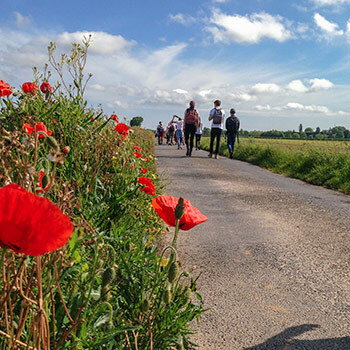 For two weeks in May, Laurier History professors Peter Farrugia and David Olivier led a group of students and Brantford community members through the battlefields, cemeteries, monuments and museums in Northern France and Belgium on a critical exploration of the remembrance and commemoration of the First World War, the Second World War and the war dead. The two world wars have long since passed, but the reverence for fallen soldiers of the British Commonwealth (including Canadians) is very much alive among residents in Northern France and Belgium. Farrugia and Olivier’s group attended The Last Post Ceremony at the Menin Gate Memorial to the Missing in Ypres, Belgium on the first evening abroad. The monument – a neo-classic archway that opens to a centre hall on Ypres’ main street – bears the names of more than 54,000 Commonwealth soldiers who died prior to August 1917 and who do not have graves. Since 1928, Ypres residents and tourists have gathered at the monument each night to honour the sacrifice and memory of soldiers lost during the Battle of Ypres. Third-year student Erin McHarge spoke with a British tourist at Menin Gate; the man’s father was a Commonwealth soldier who fought at Ypres. He shared an excerpt from his father’s war diary with McHarge, which described the horrific displacement of the town’s residents as a result of the fighting. The group had a similar experience while visiting the memorials of Dieppe, which mark the mass loss of Canadian troops during the raid in August 1942. A woman from Association Jubilee, a French-led memorial organization, offered tearful thanks for Canada’s war efforts and sacrifices. “There is a constant reminder of the wars’ significance in Belgium and France, as well as the respect and love for Canadians, especially those who have served,” says McHarge. At each stop on the course’s itinerary, Farrugia and Olivier gave onsite lectures, or stands, to contextualize the location’s history and significance. The stand at La Cambe War Cemetery, where more than 21,000 German soldiers from the Second World War are buried, addressed a difficult yet relevant topic: how is the enemy remembered? Second-year student Kayla Murray thought about the question as she walked among the small black stone crosses that represent La Cambe’s fallen. The group also visited the cemetery’s interpretive centre, an experience that required the students to think critically about the impact of passed time on memory and commemoration. The centre was built in the mid-1990s during a time of improved relations between France and Germany. While promises of peace and unification are evident throughout the centre, Farrugia says there is one critical piece of information is missing from the story – the war itself. To enrich onsite learning, all course participants (including Farrugia and Olivier) conducted research on a soldier, nurse or civilian from either war before the field experience. The biographical profiles were presented during stands at relevant locations throughout the trip. Murray, a Public Health student, prepared a biography on Brantford’s Katherine Maud Macdonald. She was the first Canadian nurse killed in the First World War. Macdonald was stationed at a British hospital that was bombed during a German air raid in May 1918. Murray read Macdonald’s profile while at the Ring of Remembrance Monument for Peace at Notre-Dame-de-Lorette, France’s largest military cemetery. Five hundred 10-foot tall metal panels stand in a circle; each panel lists 1,200 names in alphabetical order of service personnel killed during the First World War. Murray found Macdonald’s name and gave her stand on the nurse, almost 100 years to the anniversary of her death. The project hit home for McHarge, who profiled her great-grandfather, Warrant Officer John George Sherring, who served with the Canadian Army Medical Corps during the First World War. She read his profile, a piece of her own family history, at the Canadian National Vimy Memorial, near the town French town of Arras. The battlefield tour course is offered every two years in May and is supported by the Laurier Centre for Military, Strategic and Disarmament Studies, the Office of the Dean of Liberal Arts, the senior executive officer at Laurier’s Brantford campus, the Office of the Vice-President: Academic, and Laurier donor Don Wilkin. “Without those contributions, we couldn’t make this work,” says Farrugia. Farrugia says he would like to offer the battlefield tour course in the spring of 2020. Interested students and community members may contact him at pfarrugia@wlu.ca for further detail.